Pakistan will play two Twenty20s and three One Day Internationals during their short visit to India. MS Dhoni has been retained as a captain in both formats of the game keeping in view his dynamic leadership qualities. Sachin Tendulkar, one of the greatest batsmen in the world has announced his retirement from the ODIs and his services rendered for the Blue Shirts will be remembered forever. His decision to quit that form of the game has opened the doors to quite a few youngsters who will be eager to get a permanent place in the national side. The selection committee was chaired by Sandeep Patel while the skipper MS Dhoni and the national coach, Duncan Fletcher were also taken into confidence in the selection process. The important omissions from the sides included the quick bowler Umesh Yadav, the out of form all-rounder Irfan Pathan, the spinners Rahul Sharma and Pragyan Ojha, Manoj Tiwary who is a middle order batsman and most surprisingly their ace fast bowler, Zaheer Khan. All rounder Bhuvneshwar Kumar and the young fast bowler from Bengal, Shami Ahmed have been included in the side and will most likely win the Indian caps. Below, we will highlight the brief careers of the two youngsters which will reflect their credentials in the game. He was born on December 5, 1990, in Kanpur, Utter Pradesh, a right hand batsman and a right arm medium fast bowler. The youngster has played for India A, Royal Challengers Bangalore, Utter Pradesh and Pune Warriors. He did not have a great beginning in his domestic career by getting out cheaply with quite a few ducks but matured himself nicely as the time was going by. Bhuvneshwar Kumar has the quality to move the ball at a reasonable pace which creates a lot of difficulties for the batsmen. He has developed into a fine batsman who can assist his team with brisk scoring while batting at the lower order. The 22-year-old has played 31 List A matches and scored 484 runs at an average of 34.57, the best of 72 with two fifties. He has taken 40 wickets averaging 25.42 with the best of 4-28 runs per wicket. Bhuvneshwar Kumar has appeared in 25 T20s, scored 88 runs and held 18 wickets at an average of 34.44, having the best of 3-25. 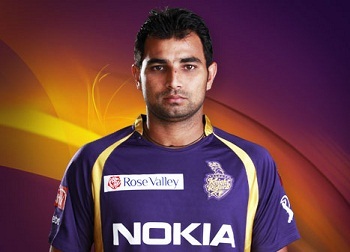 He was born on March 9, 1990, a right arm medium pace bowler and right hand batsman. He has played for India A, Bengal, Kolkata Knight Riders and is an emerging fast bowler in the horizon of the cricket world. He is an enthusiastic bowler who carries speed and accuracy at the same time which distinguishes him among the other young lot of speedsters in the country. The 22-year-old has played 13 List A matches and has grasped 25 wickets at an excellent average of 21.36 with the best of 4-62. He took part in 14 T20s and claimed 21 scalps at a supreme average of 11.66 runs per wicket. Mahendra Singh Dhoni (Capt), Gautam Gambhir, Ajinkya Rahane, Yuvraj Singh, Rohit Sharma, Suresh Raina, Virat Kohli, Ravindra Jadeja, R Ashwin, Ashok Dinda, Ishant Sharma, Bhuvneshwar Kumar, Parvinder Awana, Piyush Chawla, Ambati Rayudu. Mahendra Singh Dhoni (Capt), Virender Sehwag, Gautam Gambhir, Virat Kohli, Yuvraj Singh, Rohit Sharma, Suresh Raina, Ravindra Jadeja, R Ashwin, Ishant Sharma, Ajinkya Rahane, Ashok Dinda, Bhuvneshwar Kumar, Shami Ahmed, Amit Mishra. The inaugural T20 will be played on December 25, 2012, at M Chinnaswamy Stadium, Bangalore whereas the first ODI will take place on December 30, 2012, at MA Chidambaram Stadium, Chepauk, Chenneai.